With our family Disney World vacation happening in a few months, we’re getting our countdown out and ready. 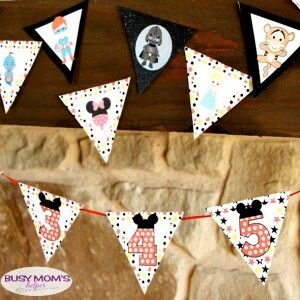 I’m excited that many of YOU can enjoy this Printable Disney Banner too!! Even if you’re not planning a Disney trip, it can be used for parties, or just for fun. (originally shared March 2016) See, isn’t it fun?! I did Mickey-eared numbers from 1-31, so you can count down the month leading up to your vacation. OR combine numbers for a birthday banner for the special persons age! There are TWENTY pages, with 4 triangle banner pieces per page. Just print them off (I recommend cardstock, but that’s entirely up to you), cut them out, then string or tape where you like. My hubby had a super idea (when I agreed it was genius, our Thor said ‘wait…what? !’ Guess he needs to come up with great ideas in front of the kids more often, but it sure was funny!) – String up the numbers, then gently tape a character one on top. So each day you take off the character to display the number! Or you can do it in reverse, and life off the number each day to reveal a surprise character. Yup, totally fun!